Flax Seed Oil is a rich source of Omega-3 essential fatty acid (EFA) which is considered important for skin care. Besides containing Omega-3 EFA's (specifically alpha-linolenic acid), flax seed oil typically contains approximately 10-20% each of Omega-6 Linoleic Acid (the other primary EFA) and Omega-9. The alpha-linolenic acid in flax seed oil is a lubricant of cell membranes. It also contains nutrients which may protect against other chronic diseases, such as hormone-dependent cancers and cardiovascular disease. Omega-3 Fatty Acids have been found to help wound healing, which is why Omega-3 supplements, and a diet of Omega-3 rich foods, might be beneficial for pet skin disorders. 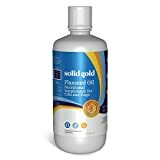 Flax Seed Oil supplements are available as refrigerated oil and softgel capsules.